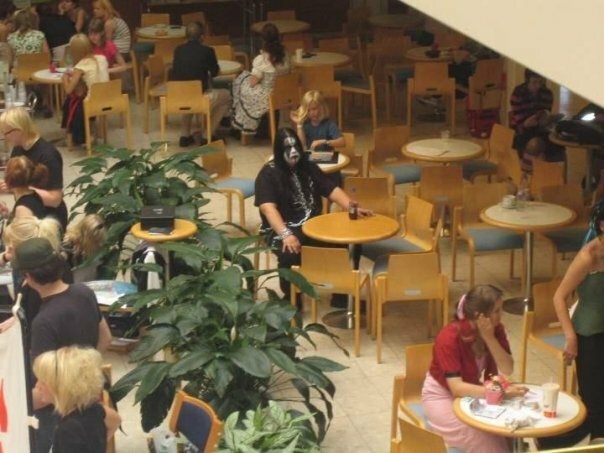 Whilst sitting in the upper food court at Epsom's sparkling Ashley Centre (spiritual home to all suicidalists), one quick-witted reader spotted this: a full death metal / jugalo / Kiss wannabe Gothrocker enjoying a cold one whilst contemplating the finer symbolism of Proust's 'A la recherche du temps perdu' as juxtaposed with the lyrics to Closer by NiN between Bacon Double Suffering burgers. Note the standard reaction of most norm's - turn your back and pretend he's not there (which is how he likes it), with the exception of one young innocent child, formulating the question in her head "Daddy, why is that man dressed all funny? He's spooky." We'll never know, little girl, we'll never know. sidenote: Submitted by 'a reader' - with a secret to hide, perhaps? Maybe a militant vegan with a secret yearning for recovered meat products. Are you a vegetarian who secretly yearns for meat? Or a vegan desperate for a ham and cheese omelette? The Jeremy Kyle team want to hear from you! Wow, an error message with a scroll bar. That is talent! As an avid metalhead, I have to protest. NOT death metal! Black metal! That's a profound difference. Black metal is satanic and morbidly atmospheric, and is to death metal what punk is to ... real rock music. :P Anyway, this guy reminds me of Abbath from Immortal make-up-wise. (The style of make up is called corpsepaint, and their wearers are dubbed "pandas" by detractors, I think it is obvious why.) Excellent choice from a humourous point of view, just google Abbath. That looks like Aerith in the bottom corner there. Must be an interesting place. this guy reminds me of the shopkeep from the metalocalypse episode where Toki's dad dies.